Hey, What a great simple reciepe. I added star anise, cinnamon and appricots. I also served with saffron rice. A littlw Moroccan twist to this fantastic recipe. Delicious! I added two garlic cloves last half and hour of cooking! The meat become so tender its falling apart! Perfect to cook up on a Sunday and use with different carbs/salads throughout the week as leftovers; only the sauce itself carries so much flavor! This will be made again! I made this dish this evening and served it over Quinoa instead of rice. It is amazing something so simple could taste so amazing. Thank you for sharing the recipe. I will make it again, but I think I will add more vegetables the next time. If you like lamb, this is a wonderful recipe. Hi Tori, about to try this for the first time tonight. Had a quick question, I noticed there are a few steps where you remove the fat. Is that to make it lighter or some other reason? Isn’t the fat one of the more flavorful components? Thanks! Hi Travis, I hope you enjoyed it. Lamb is generally VERY fatty. 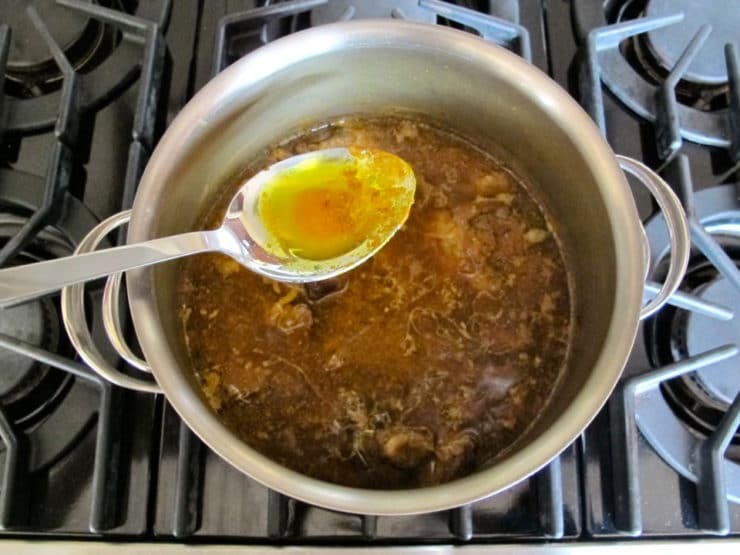 Normally I like leaving the fat in for soups and stews, but here the fat would be overwhelmingly rich to my taste. It will still have plenty of fat and moisture after removing excess fat. My family Absolutely loved this dish!! 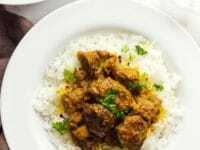 I prepared and cooked it right to recipe and it turned out amazing..
Before I make this, can you add curry powder to it? I suggest trying it as written first, the curry powder might work but it also might make it overly spicy depending on which powder you use. Without testing it myself I can’t give you a firm answer on this. We loved it, my husband had seconds which is the best complement in my book. Looking forward to making it again but planning the lamb in advance. The market was picked over when I got there but I just HAD to try it. Add some eggplant/aubergine after browning the meat and you get a lovely creamy consistency. Highly recommend this recipe! Oddly enough, this recipe was the first time I’ve ever cooked lamb. And the second time I’ve ever eaten lamb. The first time I had lamb was in a Peruvian restaurant in a stew. I was feeling bold one day and had found this recipe and decided to go for it. This recipe is absolutely fabulous. I added a can of garbanzo beans at the beginning when adding the water and spices. I just read a comment about adding green beans and think I may do that next time. I use 3 lbs of boneless leg of lamb, ciapetti brand. This is in my normal rotation now and I make it about once a month. It freezes wonderfully. For me, the sauce never comes out thin, it actually comes out a bit thicker than what I see in the pictures. I love this recipe!! Thought this was a bit bland… Sauce was a bit too runny. Followed the recipe as listed. Lovely flavour. The whole family enjoyed it…even the 11 month old. Making this right now! Hag Sameach! How wonderful to find your site! Best lamb stew recipe I have ever tried. (I did leave out the red pepper.) The other reviewers variations with potatoes, green beans, prunes etc. sound wonderful too. Thanks so much! I’m making it a second time now as we really liked it. Used lamb neck stew meat as it was on sale. Also browned the meat separate as suggested by others. Otherwise no changes, and will not make changes on my second go around either. Thank you, it’s a keeper. This stew was delicious. My 7 year old daughter loved it (I halved the red pepper flakes and black pepper), and my husband loved it too. I did add 2 cloves of garlic to the onion mixture, and I threw in a few stalks of cilantro toward the end of the cooking process for extra flavor instead of putting it on as garnish. Another reader asked about adding dried prunes or fruit. I added a small handful of dried prunes near the end of the cook time and it didn’t make it sweet at all. I think it just gave it more body. I’ve never had Persian lamb before, but this was delicious. Thanks for sharing this recipe. I made this last night and it was amazing and super easy. I did make two changes which were to add diced red potatoes like Carol (above) did. Also, I cooked the lamb and onions separately to get some browning on the meat. I’m sure it would have come out great either way. In my area (NJ) it was a challenge finding the lamb stew meat at regular supermarkets but I finally found it at Whole Foods which had it cut up and very lean. Chag sameach! 🙂 I’m making this recipe right now, and wondering if you think raisins or prunes would be good to add as the lamb is simmering? PS – I LOVE your recipes – those I’ve tried, and those I haven’t (yet)! Hello there– I’m guessing you’ve already tried this 🙂 I personally prefer the savory flavor of this recipe and wouldn’t add anything sweet to it. However, it might be a good flavor for some folks. It’s sort of a taste preference. Hope you enjoyed it! Do you know if this recipe is common throughout Afghanistan? During a tour there, our interpreters made us a lamb stew that seemed similar to this. Sauce was more on the runny side, not super thick. We poured it over basmati rice with raisins and used naan to sop up the leftover sauce. 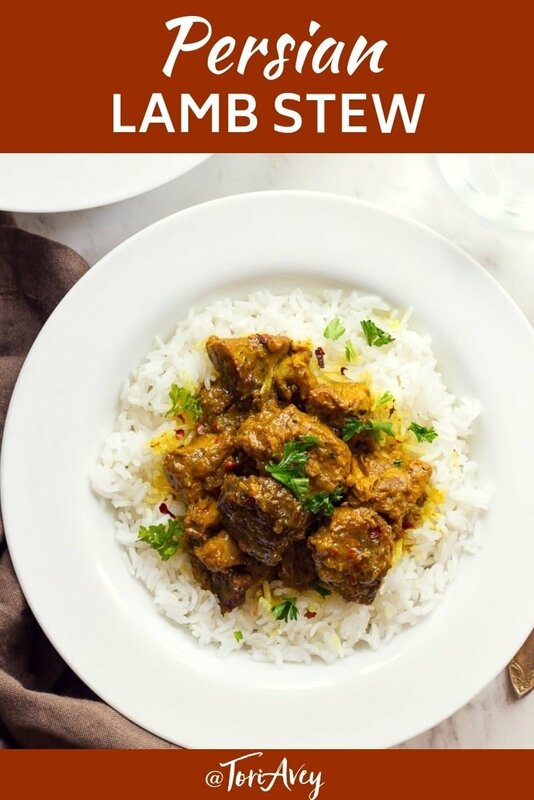 It was almost more of a curry and they utilized crushed tomatos, so I looked through North Pakistani cuisine and the only thing I found similar was Lahore-style lamb curry. When I asked the interpreter, he gave me a list of only a few ingredients which included turmeric but no curry powder. When I saw this I thought it might be my missing link. Hi Kevin, I learned this recipe from my friend Farah who was born in Iran and grew up in Israel. It’s possible that it is also common in Afghanistan, but I wouldn’t know for certain. I will say that this recipe is quite flavorful and somewhat spicy (it’s got a “kick” to it). Whether it’s the same or not, I do encourage you to try it– it’s quite delicious! There is so much Persian influence in Afghanistan that I am not surprised (the similarity between Dari and Farsi is an indicator). I would be interested to know where in Afghanistan this was as I would expect Persian influence in the North (Herat) and in Kabul, but less so in the South East. I made the stew last night and it was a big hit with my little kids! The sauce however seemed thin despite following the recipe exactly. Do I simmer the stew covered or lid off? Hi Lisa, I usually simmer it uncovered which helps the sauce to thicken and reduce. 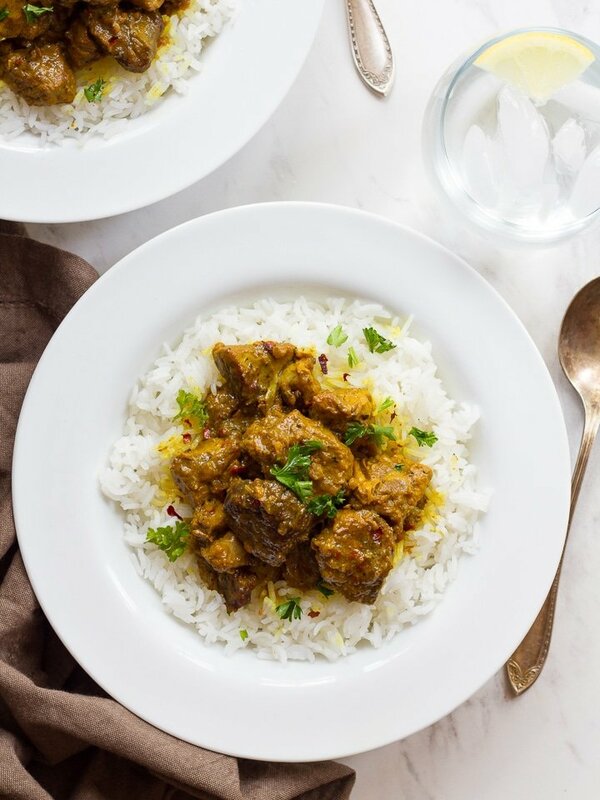 Can you make this persian lamb stew in a crock pot?? Used garlic, garam masala and cumin. Very flavorful BUT definintely reduce the red chili flakes. 1/2 tsp if you want mild and moderate 1 tsp. Shavua tov & chag sameach. I’ve used this recipe around 10 times now – I absolutely love baghali polo and to realize how simple it is to make – amazing. I usually order this from a great takeaway in London UK (its called Kish in Kilburn if you’re ever in town), but prefer it with white rice over the dill version. I love it with the Baghali Polo too, Josh! Happy you’re enjoying it. Wow!! A 5 star recipe!! Absolutely love it; will be cooking it often. Excellent recipe! So easy, simple and delicious. We will be making this regularly. My husband is on a strict diet and cant eat lamb or beef. Can I substitute chicken in this recipe? Hi Julie, I’ve never tried this with chicken so not sure what modifications might need to be made. 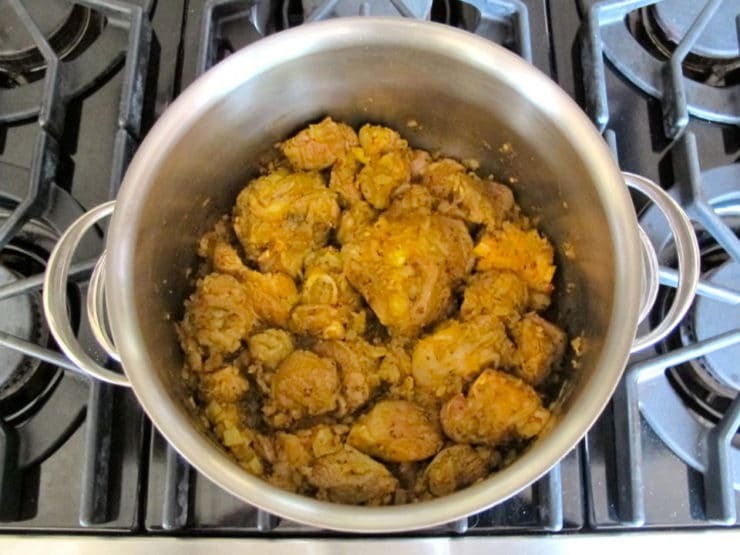 If you decide to try it, you might try bone-in chicken and slowly simmering until the meat is very tender. Good luck! I made this as a surprise for my wife. This was a great recipe! I added to the spices because I am from the southwest and we love heat. All I can say is WOW! I just have to say that this dish has become our family favourite. My eight year old son requests this every week and sometimes even twice. Please keep recipes like this coming. I recently did this recipe for our Seder (second year in a row, and still a hit!) and honestly, I want this dish more than once a year. Lol. Lamb is so expensive… I was wondering if you think a substitution of chicken or steak would work? Would I need to switch out any spices to cater to the diff meats and/it change cook time? Love this recipe! 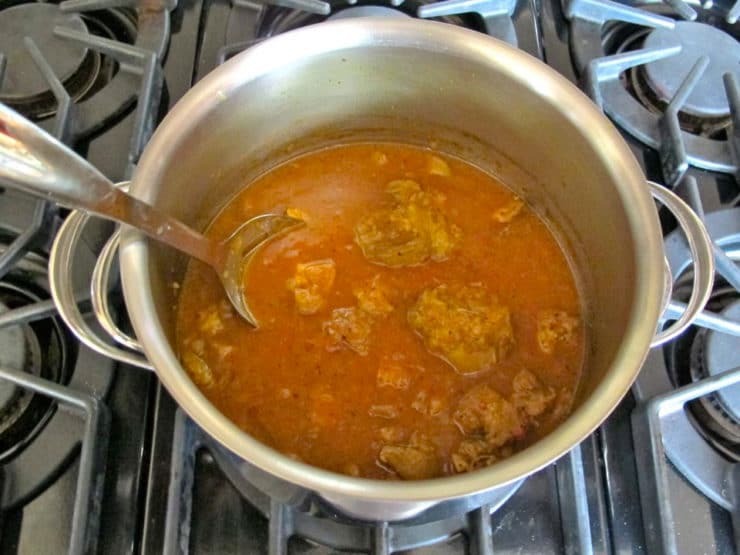 Hi Jessica, I’ve also made this recipe with beef stew meat with good results. It’s not quite as tasty as lamb in this particular preparation, but still very good. I saw several comments as to whether this can be made in a crockpot – but no replies. I made tis on the stove – but I don’t have the couple hours it takes to stand over it and skim while it simmers. Could you please reply to this? Hi Kristen, I don’t see why it wouldn’t work in a crockpot, but there will be a lot of fat collected at the top when it’s done so you’ll need to do a lot of skimming. Also I can’t give you an exact measurement on liquid; it will likely need less because the liquid won’t reduce as it cooks. If I were trying it I’d cook it on low for 8-10 hours and use 3 cups of liquid, but that’s just a guess. If you give it a try please let us know how it works for you. I am Persian, however, I’ve never seen or heard about that dish. It looks good and the style is Persian (ie. turmeric, tomato paste, onions), but it’s missing something…I’ve never seen it served just with meat. Usually, you add either eggplants (Khoresh badenjamn) or split lentils (khoresh gheymeh) or some kind of vegetable to it. Then it would be Persian. This is more “persian inspired”. But like I said… still looks good! Hi Mina, I learned this dish from Farah, who is Persian– she considered it Persian and made it with her family growing up. Thanks, this is one of those Recipies thats a keeper. I make this at least once a month. delicious. So happy to hear that Sam! Has anyone tried to make this in the crock pot? How would u do it? I am preparing a Middle Eastern dinner for eight for this coming Saturday evening. Believe it or not, I’m using TWO of your recipes (the other is falafel). Plan to use this as the main dish. Question: you told Joana she could make the Persian stew the day before. But I need to do as much as possible as soon as possible. Could I make this today (Tuesday) and freeze it for a few nights? Hi Brian, I’ve never frozen this but most stews freeze quite well and I have to reason to think this one will be any different. If it were me I would refrigerate it first, skim off the solid fat that rises to the top of the sauce, then freeze. Enjoy! Here’s my report on freezing the stew. I made it on Tuesday, refrigerated it overnight. Froze it Wednesday. On Saturday, I removed it from the freezer then thawed/heated it in the microwave. That’s all. Served it straight from the microwave. It was wonderful. We had so much food last night that not all of it was consumed, so my wife and I had leftover Persian lamb stew after church today. So good! We served it with brown basmati. Thank you for blessing the world with your talents, Tori! Thank you for reporting back Brian! Glad you enjoyed the stew, and so happy my recipes helped make your night special. can I do it the day before? will it be as good? Yes, you can make ahead and refrigerate overnight. Skim the fat (solid white stuff) that rises to the top of the sauce, then reheat on stovetop to a simmer. I want to do this recipe with leg which has a lot of bones and less meat. Should I add the amount of sauce accordingly to the weight of the meat or cut down a little? It should be 3 pounds of meat/bones together, doesn’t matter if it’s more meat or more bones as long as the weight is 3 pounds total. I don’t think you’ll need to adjust the amount of sauce, but I usually use more meat than bones so I can’t say for certain. Thank you! Even with no sauce it was delicious. I have a question. I only made 1 lb of lamb so I only added two and half cups of water. After an hour of low heat cooking most of the water had evaporated. So I just added tomato paste and cooked it for another ten mins. By then there was barely an sauce left. Should I have put four cups of water even though I had only one lb of meat? Hi Zeenie– yes, this is not a recipe where you can “halve” all the ingredients. You really need the full amount of sauce, even for a reduced amount of meat. I’m wondering how spicy this recipe is? I love the heat, but my hubby… not so much. Hi Jessica– I wouldn’t say it’s super spicy, but I am a fan of spice like you. It does have a lot of spices, but in terms of heat level it is not very hot. 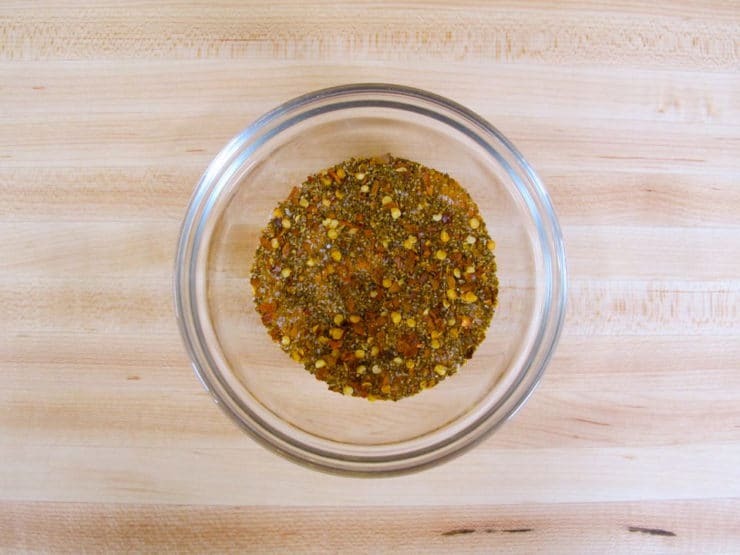 If you’re worried about it you can cut the hot pepper flakes in half and add more to taste, that is where the small amount of heat comes from. I made this last week using a half shoulder (in one large piece, not cubed) and currently have it braising on the stove using whole shanks. Amazeballs recipe! Isn’t it awesome Joshua?? So happy you like it! I made this today. I did it exactly the same except I added some chopped garlic half way though cooking onions. It was YUMMY!! I served with Regular white rice as my supermarket was out of basmati still tasted good! So great to hear that Marianna, thank you for writing! Hi Tori! This looks AMAZING. Thinking of doing a Sephardic theme for the second night of passover and will incorporate this! At 28 I’ve taken on the responsibility of cooking for all Jewish holidays as I got sick of my family ordering from Zabar’s and Fairway every year. Of course I work full time so I’m wondering if there would be a good way to do this in the crock pot while I’m at work? Hi Jackie, I think it would work quite well in a crock pot but I’m not sure if it will need quite as much liquid, since it won’t reduce in a covered cooker. If I were to try it I would probably only add 3 cups of water and cook it on low for 8-10 hours, and you’ll likely need to skim quite a bit of fat from the top of the liquid at the end of cooking. 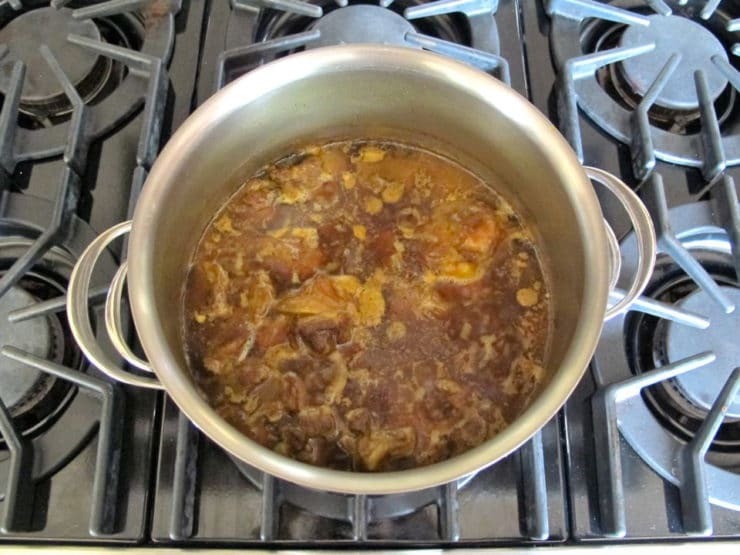 I’m making this as I type and have a quick question – do you cover the pot when it’s simmering for two hours, or leave it open? Thanks! Hi Kate. No need to cover the pot, but do make sure it’s simmering slowly on medium low or low. This way the sauce will reduce. If you feel more comfortable covering the pot, make sure it’s vented so that some of the liquid can evaporate. Keep an eye on it to make sure the liquid doesn’t reduce too much or get dry. Enjoy! What about adding some dill? Great and easy stew Tori. Maybe my mouth is crazy, but I feel it needs some sweet too. Not sure if currants, raisins, grapes or dates. I served mine over whole grain couscous. I did it and it was so easy and soooo tasty!! This looks amazing and relatively easy. We love lamb and eat it with some regularity and I’m definitely adding this to my repertoire. Can’t wait to serve it to my family. Hi Keni– yes, garlic and cumin would both work well in the recipe. 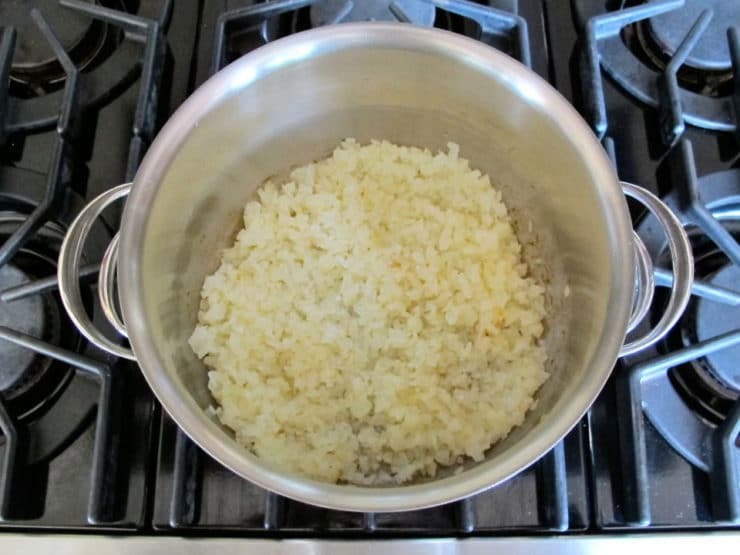 I would add 2-3 cloves of minced garlic and 1-2 tsp of cumin (to taste). Enjoy! 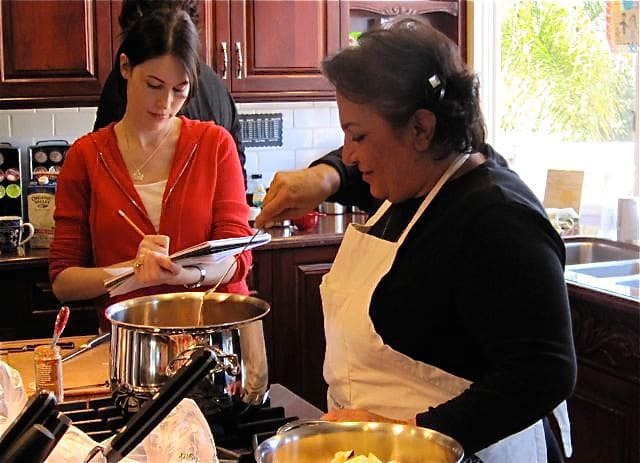 Hello Tori, the recipe sounds delish, do you think that garlic can be incorported in the recipe? I love garlic. Just found your blog, wish I had found it earlier. What a great dish. My father says he doesn’t like lamb, but I am going to try him on this dish, bet he will love it. Thanks for publishing it. Its wonderful. Can you post the dill rice with lima beans too? its my favorite and to know how to make it would be awesome! Also, tried this recipe tonight, it was SO GOOD! its amazing that so few ingredients could be so super delicious. I wound up getting two lamb shoulder cuts (bone in) and deboning it and cubing it up pretty big (and when I say I did that, I mean my boyfriend did it) but then put the bones in to simmer with the sauce for the flavor. It was so good, definately a make again! Often! Hi Tori, do you think I could substitute chicken for this? I want to make it but I don’t eat lamb. It may have a different taste, but I bet it will still be good. Thank you, I would love to learn more about Persian cooking! Update! I made this for dinner this evening and I used beef in place of the lamb (because I don’t eat lamb) and it turned out AWESOME!!!! I added a couple of diced red potatoes during the last half hour of cooking. Thank you for another outstanding recipe, Tori!!! Happy it turned out well for you Carol! How amazing is that? I would love to have someone come give me a cooking lesson in another cuisine. And it would be worth every single one of those calories 😉 This stew sounds fantastic and the experience sounds priceless. I made this last night and it was incredibly easy and delicious! Will be a regular on our menu! Thanks for the great instructions. I love lamb. For a long time I was terrified of going back to my favorite Afghan restaurant because I was terrified that they used butter in their rice (dairy + meat= NO-NO!) But I went back today and they informed me indignantly that they use only vegetable oil on the rice! Yay. So I ordered Moroccan Lemon Chicken.. mmm. 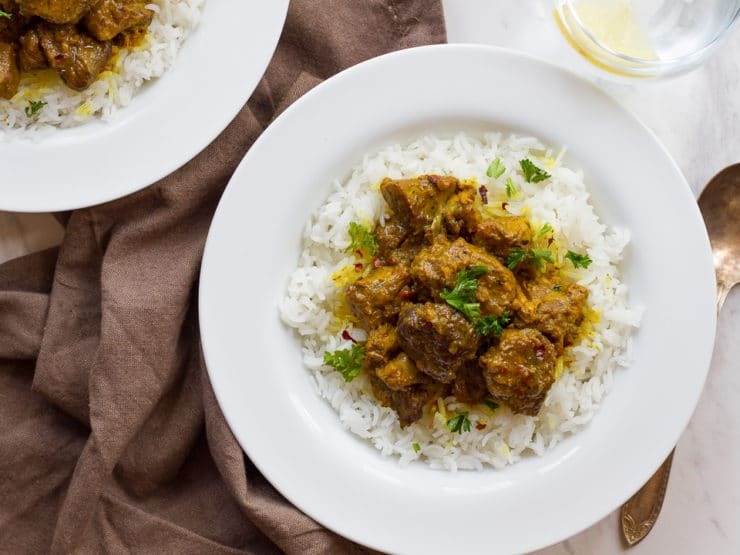 But lamb is my favorite meat of all time, especially well-spiced ethnic lamb recipes like this. It’s almost like Indian biryani… but the Indian biryanis were introduced to India by Persian conquerors, so maybe it’s the same dish! Mmmm. So delicious. looks amazing. could you give more specifics regarding the cut of meat? I mean is it leg, shank, etc and also: in one of the pictures it appears that there are bones included…yes? I imagine that would add to the quality of the final gravy (flavor, gelatin) thanks! I will be making this. Hi Moshe! Ask the butcher for either boneless or bone-in lamb stew meat. It’s really a matter of preference. Sometimes I use boneless, and sometimes I use a combination of bone-in and boneless because the bone-in gives a little more moisture and flavor. I’ve found that leg meat cut into stew pieces works particularly well. Ask them to trim the excess fat for best results. Enjoy! Looks delish Tori, now how about the recipes for the other things you listed…YUM! Tori, this stew looks absolutely wonderful! I can just imagine the aromas wafting throughout your house from all this cooking! What a fun learning day 🙂 Farah is an awesome gal! I’ll totally make this soon when we get a cool day here in So Cal 🙂 Thank you so much for sharing this with us and please thank Farah, too! Oh Tori this is a beautiful dish. How lucky for you to have Farah come show you and us this one. May I just say how cute you look. Red is so you girl. I have to say I just want to reach in and steal that big pot. It’s beautiful. Farrah looks like a fun person to have in the kitchen and her dishes sound amazing! Tell her I said hello and thanks for sharing her time with us! I want Farah in my kitchen! All of this food looks incredible. I especially love the bowl of beautiful spices! I’m in LA, we get to have so much persian food. I should really solicit one of my friends to teach me how to authentically cook persian! This stew looks so flavorful! Looks like a very flavorful stew! I love your step-by-step photos! I love the step by step photos too. I am planning to make this dish tonight. Thank you for sharing your recipe.